The VMware 2V0-731 exam preparation guide is designed to provide candidates with necessary information about the VCP7-CMA exam. It includes exam summary, sample questions, practice test, objectives and ways to interpret the exam objectives to enable candidates to assess the types of questions-answers that may be asked during the VMware Certified Professional 7 - Cloud Management and Automation (VCP7-CMA) exam. It is recommended for all the candidates to refer the 2V0-731 objectives and sample questions provided in this preparation guide. The VMware VCP7-CMA certification is mainly targeted to the candidates who want to build their career in Cloud Management and Automation domain and demonstrate their expertise. We suggest you to use practice exam listed in this cert guide to get used to with exam environment and identify the knowledge areas where you need more work prior to taking the actual VMware Certified Professional 7 - Cloud Management and Automation exam. We are committed to helping you clear your VMware 2V0-731 Certification exam. You can easily pass VMware Certified Professional 7 - Cloud Management and Automation (VCP7-CMA) using our online preparation platform which provides 2V0-731 practice exam. Our team of experts has designed this practice exam based on their 10+ years of experience in the Cloud Management and Automation domain and expertise in VMware Technology. 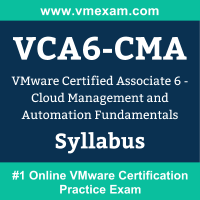 We have carefully maintained weights of VCP7-CMA syllabus topics, exam pattern, timed exam environment, and scoring system same as the actual VMware Certified Professional 7 - Cloud Management and Automation (2V0-731) exam. Our experts have included practical and scenario-based questions in VMware VCP7-CMA practice exam; such questions are the most frequently asked in the actual 2V0-731 Certification exam. We believe in "The More You Use, The More Confidence You Gain", please try our sample VMware 2V0-731 practice exam to build the trust. The VMware 2V0-631 exam preparation guide is designed to provide candidates with necessary information about the VCP6-CMA exam. It includes exam summary, sample questions, practice test, objectives and ways to interpret the exam objectives to enable candidates to assess the types of questions-answers that may be asked during the VMware Certified Professional 6 - Cloud Management and Automation (VCP6-CMA) exam. It is recommended for all the candidates to refer the 2V0-631 objectives and sample questions provided in this preparation guide. The VMware VCP6-CMA certification is mainly targeted to the candidates who want to build their career in Cloud Management and Automation domain and demonstrate their expertise. We suggest you to use practice exam listed in this cert guide to get used to with exam environment and identify the knowledge areas where you need more work prior to taking the actual VMware Certified Professional 6 - Cloud Management and Automation exam. We are committed to helping you clear your VMware 2V0-631 Certification exam. You can easily pass VMware Certified Professional 6 - Cloud Management and Automation (VCP6-CMA) using our online preparation platform which provides 2V0-631 practice exam. Our team of experts has designed this practice exam based on their 10+ years of experience in the Cloud Management and Automation domain and expertise in VMware Technology. We have carefully maintained weights of VCP6-CMA syllabus topics, exam pattern, timed exam environment, and scoring system same as the actual VMware Certified Professional 6 - Cloud Management and Automation (2V0-631) exam. Our experts have included practical and scenario-based questions in VMware VCP6-CMA practice exam; such questions are the most frequently asked in the actual 2V0-631 Certification exam. We believe in "The More You Use, The More Confidence You Gain", please try our sample VMware 2V0-631 practice exam to build the trust. The VMware 1V0-603 exam preparation guide is designed to provide candidates with necessary information about the VCA6-CMA exam. It includes exam summary, sample questions, practice test, objectives and ways to interpret the exam objectives to enable candidates to assess the types of questions-answers that may be asked during the VMware Certified Associate 6 - Cloud Management and Automation Fundamentals (VCA6-CMA) exam. It is recommended for all the candidates to refer the 1V0-603 objectives and sample questions provided in this preparation guide. The VMware VCA6-CMA certification is mainly targeted to the candidates who want to build their career in Cloud Management and Automation domain and demonstrate their expertise. We suggest you to use practice exam listed in this cert guide to get used to with exam environment and identify the knowledge areas where you need more work prior to taking the actual VMware Certified Associate 6 - Cloud Management and Automation Fundamentals exam. We are committed to helping you clear your VMware 1V0-603 Certification exam. You can easily pass VMware Certified Associate 6 - Cloud Management and Automation Fundamentals (VCA6-CMA) using our online preparation platform which provides 1V0-603 practice exam. Our team of experts has designed this practice exam based on their 10+ years of experience in the Cloud Management and Automation domain and expertise in VMware Technology. We have carefully maintained weights of VCA6-CMA syllabus topics, exam pattern, timed exam environment, and scoring system same as the actual VMware Certified Associate 6 - Cloud Management and Automation Fundamentals (1V0-603) exam. Our experts have included practical and scenario-based questions in VMware VCA6-CMA practice exam; such questions are the most frequently asked in the actual 1V0-603 Certification exam. We believe in "The More You Use, The More Confidence You Gain", please try our sample VMware 1V0-603 practice exam to build the trust.